Objective:In this study, we aimed to evaluate some laboratory and clinical factors in the prediction of latency period for pregnant patients complicated with preterm premature rupture of the membranes.Materials and Methods:Sixty-five pregnant patients between 24 and 34 weeks of gestation, who were admitted to University of Çukurova School of Medicine Hospital with the diagnosis of preterm premature rupture of the membranes (PPROM) between January 01, 2013 and December 31, 2013, were included in this study. Serum CRP, procalcitonin, sedimentation rate, leukocyte count and cervical length (measured with transvaginal ultrasound) of patients were analyzed for the correlation with the latency period.Results:None of the parameters were found to be correlated with the latency period. However, patients with cervical length of <25 mm were found to have shorter duration of latency.Conclusion:Although preterm premature rupture of the membranes is thought to be either an infection-based disease or a disease increasing the risk of infectious complications, major infection markers are not found to be helpful criteria for the prediction of latency period. Patients with a cervical length of <25 mm can be expected to deliver earlier and, therefore, can be referred to a tertiary center earlier. Epidemiology and causes of preterm birth. This paper is the first in a three-part series on preterm birth, which is the leading cause of perinatal morbidity and mortality in developed countries. Infants are born preterm at less than 37 weeks' gestational age after: (1) spontaneous labour with intact membranes, (2) preterm premature rupture of the membranes (PPROM), and (3) labour induction or caesarean delivery for maternal or fetal indications. The frequency of preterm births is about 12-13% in the USA and 5-9% in many other developed countries; however, the rate of preterm birth has increased in many locations, predominantly because of increasing indicated preterm births and preterm delivery of artificially conceived multiple pregnancies. Common reasons for indicated preterm births include pre-eclampsia or eclampsia, and intrauterine growth restriction. Births that follow spontaneous preterm labour and PPROM-together called spontaneous preterm births-are regarded as a syndrome resulting from multiple causes, including infection or inflammation, vascular disease, and uterine overdistension. Risk factors for spontaneous preterm births include a previous preterm birth, black race, periodontal disease, and low maternal body-mass index. A short cervical length and a raised cervical-vaginal fetal fibronectin concentration are the strongest predictors of spontaneous preterm birth. The Preterm Prediction Study: prediction of preterm premature rupture of membranes through clinical findings and ancillary testing. The National Institute of Child Health and Human Development Maternal-Fetal Medicine Units Network. Antibiotics for preterm rupture of the membranes: a systematic review. We sought to evaluate the administration of antibiotics to pregnant women with preterm rupture of membranes (PROM). We collected data by using the Cochrane Controlled Trials Register and MEDLINE. We included randomized controlled comparisons of antibiotic versus placebo (14 trials, 6,559 women). Antibiotics were associated with a statistically significant reduction in maternal infection and chorioamnionitis. There also was a reduction in the number of infants born within 48 hours and 7 days and with the following morbidities: neonatal infection (relative risk [RR] 0.67, 95% confidence interval [CI] 0.52-0.85), positive blood culture (RR 0.75, 95% CI 0.60-0.93), use of surfactant (RR 0.83 95% CI 0.72-0.96), oxygen therapy (RR 0.88, 95% CI 0.81-0.96), and abnormal cerebral ultrasound scan before discharge from hospital (RR 0.82, 95% CI 0.68-0.99). Perinatal mortality was not significantly reduced (RR 0.91, 95% CI 0.75-1.11). A benefit was present both in trials where penicillins and erythromycin were used. Amoxicillin/clavulanate was associated with a highly significant increase in the risk of necrotizing enterocolitis (RR 4.60, 95% CI 1.98-10.72). The administration of antibiotics after PROM is associated with a delay in delivery and a reduction in maternal and neonatal morbidity. 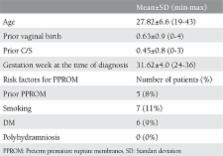 These data support the routine use of antibiotics for women with PROM. Penicillins and erythromycin were associated with similar benefits, but erythromycin was used in larger trials and, thus, the results are more robust. Amoxicillin/clavulanate should be avoided in women at risk of preterm delivery because of the increased risk of neonatal necrotizing enterocolitis. Antibiotic administration after PROM is beneficial for both women and neonates. Copyright statement: © Turkish Journal of Obstetrics and Gynecology published by Galenos Publishing House. Diagnostic power of the vaginal washing-fluid prolactin assay as an alternative method for the diagnosis of premature rupture of membranes. Amniotic fluid myeloperoxidase in pregnancies complicated by preterm prelabor rupture of membranes. Coagulation and fibrinolysis in amniotic fluid: physiology and observations on amniotic fluid embolism, preterm fetal membrane rupture, and pre-eclampsia.